The price of a credit card machine can seem expensive for a small business. However, in order to compete, stores need to be able to accept many forms of payment. To help, we created an optional credit card processing system that you can use with the NRS POS system. 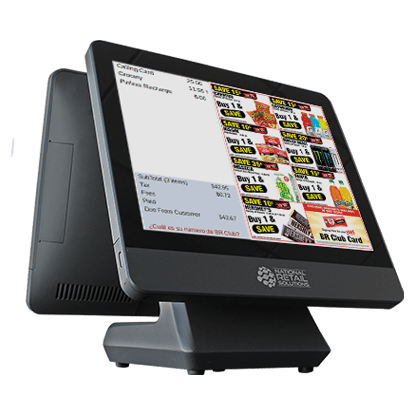 Our POS system works better than a basic cash register, and the credit card terminal comes at an affordable price. What Is an EMV Machine? An EMV card reader lets customers use a credit or debit card to pay for their purchase. Our EMV machine features the latest card processing technology. It can take regular cards, cards with chips and mobile payments. Once the customer uses their card or their phone for payment, they’ll enter a PIN or sign their name to finish payment. The machine features an attached digital pen that customers can use to press buttons on the screen or sign their name. Your customers can use your credit card reader to pay whichever way they prefer. Even low-income customers can buy from you using EBT. We provide a low flat rate for your transaction charges. Every time a customer swipes, dips or taps their card or phone, you pay an affordable fee designed for small businesses. A transaction costs 2.49 percent of the transaction total plus 10 cents. If you process over $10,000 a month in payments, you could qualify for an even lower custom rate. Why Should I Use a POS System With Credit Card Processing? Market leadership: Most big competitors already use card readers. If you take cash only, your customers may feel tempted to go to another location that accepts cards. When you use a credit card terminal, you keep customers coming back to your business. Convenience: When you receive cash payments, you must deposit them in the bank yourself. The money you earn through our card reader goes right to your bank account within 24 hours. Security: EMV technology protects you and your customers from credit card fraud. Having less cash in your register also discourages thieves from targeting your store. Increased sales: Accepting cards increases your sales and the chance of customers making impulse purchases. Who doesn’t want to see their sales go up? We make our POS simple and affordable so that small businesses like yours can keep up with the competition. Request a quote to see how little it costs to add an EMV machine to your package.